Andrews McMeel Publishing, 9781449475864, 28pp. 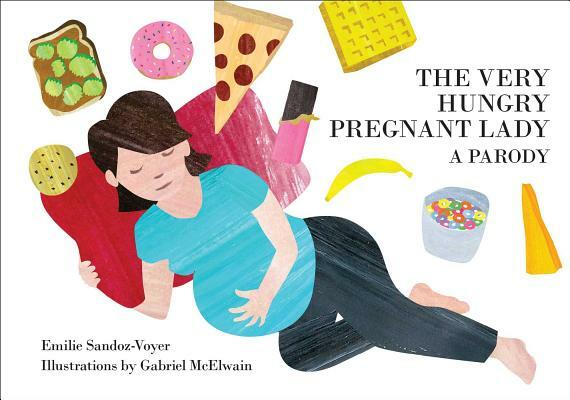 A lighthearted parody of Eric Carle's much-loved classic The Very Hungry Caterpillar, The Very Hungry Pregnant Lady tackles the mysteries faced by pregnant women everywhere—namely, how can I have so little space for my stomach and yet be hungry all the time? And is it better to try unsuccessfully to sleep, or just give in and have another snack? Pairing playful text with bright, colorful images, The Very Hungry Pregnant Lady is both a send-up and a celebration of this strange, ridiculous, and exciting time in the lives of all mothers-to-be. Emilie Sandoz-Voyer is a writer, editor, former very pregnant lady, and mother of two. As an editor at Chronicle Books, Emilie acquired and managed entertainment titles and stationery with an emphasis on humor, pop culture, and travel. Whether writing about cats, wookiees, or the indignities of pregnancy, Emilie delights in the silly and strange. When she’s not chasing after her two young kids, she works on a wide range of fiction and illustrated book projects. She lives in Seattle with her family. Gabriel McElwain is a cartoonist and illustrator whose work has been published in The Chicago Maroon, Game and Player, and Adventures In Meditating. He enjoys writing songs and reading non-fiction. He lives in the Midwest with his family.